This year’s hcmf// Composer in Residence talks about his new 20-piano work Investigations, while musicians Laurent Estoppey and Reinier van Houdt discuss how they tackle performing his inventive graphic and film-based scores. Such a sight – and sound – will greet audiences with the world premiere of Investigations, Marclay’s new work for 20 pianos and pianists, at Huddersfield Contemporary Music Festival, where he is this year’s Composer-in-Residence. But more on that later. After all, Christian Marclay, failed pianist and choreographer of 1,760 ivories is just one of many confounding yet inspired juxtapositions that have driven his four-decade career. A visual artist whose work is inseparable from sound. A turntablist whose boldest vinyl interventions often took place away from the decks. A composer who has used notation in his scores without being able to read it himself. An inventive mind whose signature works – such as The Clock – are ones where appropriation and sampling serve irresistibly simple yet satisfyingly complex ideas. Born in 1955 in California to Swiss and American parents and raised in Geneva, Marclay’s art studies took him from Switzerland to Boston, Massachusetts, where he studied sculpture, and then to New York, plunging into its heady late ‘70s whirlpool of creativity. His head filled with Fluxus, Duchamp and Beuys, the city’s punk rock scene appealed to him as much for its performance art aspects as for the low-to-non-existent technical barriers to entry. Instead of a guitar, Marclay picked up a tape recorder, making his own backing tracks for his musical duo The Bachelors, Even (spot the Duchamp reference), before cutting out the middle step and bringing turntables onstage with him. While the pioneering DJ Grandmaster Flash and his Furious Five were laying hip hop’s foundations with their residency at Disco Fever over in the Bronx, in Manhattan Marclay was exploring a parallel path of innovation drawn more from John Cage and musique concrète, mixing records at different speeds and working violent scratches, abrupt cuts and surface hiss into the sonic texture. In addition to mixing techniques, Marclay interrogated vinyl records’ potential as physical sound objects. Echoing Milan Knižák’s Destroyed Music, the Czech Fluxus artist’s 1960s experiments with scratching, breaking and reassembling records, Marclay used a jeweller’s saw to carefully cut out and swap segments from vinyl. Often using the coloured and picture discs that abounded in bargain bins at the time, he also combined sizes and speeds, creating a new and unique disc each time. Away from the decks, the records’ own acoustic properties inspired his 1984 video Record Players, featuring a group of people scratching discs by hand, rubbing them together, flapping them back and forth then snapping them and walking on the pieces. This latter action surfaced again in his late 1980s installations where records covered the floor of galleries, forcing visitors to mark them with their footsteps. The degradation that awaits every new record was highlighted by his 1985 release, Record Without A Cover. One not to be filed next to The Return of the Durutti Column, the sleeveless LP mixed a typical Marclay collage with prerecorded surface hiss, which would inevitably increase as real-world dust and damage accrued. Of course, the original pressing is now highly collectible, a fact Marclay nodded to with his 1987 EP, Untitled (Record Without a Groove), a slickly packaged disc that could never be played. As the 1980s drew to a close, Marclay’s relationship with recording media became ever more sculptural. He melted down vinyl, constructed Moebius loops of cassettes and let reel-to-reel machines spew piles of tape onto gallery floors. For The Beatles (1989) the group’s catalogue was transferred onto tape and then crocheted into a plump pillow. The Sound of Silence (1988) took the pun in Simon and Garfunkel’s hit a step further with a black and white photograph of the seven-inch single, perpetually cued to play on viewers’ mental jukeboxes. Without an LP in sight, many of these concepts feed into Investigations, as Marclay explains: ‘Investigations further questions the relationship between sound and image. I’m curious about how an image can trigger sound in the imagination of the viewer,’ he says. Instead of a gallery visitor, here sonic impressions arise in the minds of, and are interpreted by, 20 musicians, each of whom have been given a score consisting of 100 photographs. In an echo of the collection of fragmented images of open mouths silently singing or screaming in his 1988 photographic work Chorus II, these all show hands in the act of playing piano. ‘This project came about not only because of my interest for the instrument, but also for the way it has been represented. With its black and white keys the piano is a very photogenic instrument,’ Marclay notes. It’s not the first time he’s highlighted the piano’s visual grace: in 2011, his audiovisual composition Pianorama saw Steve Beresford improvising along with a film of his own performance, edited so that the keyboard ran in a continuous loop projected onto an 18-metre circular screen at London’s Roundhouse. The evolution of Christian Marclay, scourge of audiophiles, into Christian Marclay, composer of scores is bound up in his work from the 1990s onwards. As vinyl gave way – for the time being – to the less tactile, more durable compact disc, Marclay’s work shifted towards photography and film, yet using the same magpie-like sampling techniques and still finding new ways to unmoor our familiar associations of sound with image. Hollywood became his crates to dig through. His seven-minute film Telephones (1995) compiled and subverted the cinematic tropes associated with phone conversations; the four-screen Video Quartet (2002) created a celluloid ensemble of stars ‘playing’ instruments onscreen. Even more meticulously edited, his monumental film The Clock (2010) collects thousands of clips of clocks, watches and other time references, progressing minute by minute through 24 hours in sync with wherever it is displayed. At the same time, Marclay works such as Graffiti Composition (1996) ceded control to the public. Five thousand sheets of blank music stave paper were pinned up around Berlin for a month for people to scrawl on, notate music, deface or stick their own posters to as desired, with the results turned into a 150-card graphic score. Elements of both combine in Screen Play (2005), a video score where the edited film clips often collide with overlaid staves, dots and other shapes for musicians to interpret in conjunction with the action. So how does a musician approach playing such scores? ensemble baBel’s hcmf// concert features two video scores – Fade To Slide (2010) and The Bell and the Glass (2003), and To Be Continued (2016), a graphic one collaged from found comic books. Do Laurent Estoppey and his fellow musicians establish a kind of visual system or code of correspondence for interpreting the images as music, or do they work more on instinct and mood? He agrees that the players must navigate the twin temptations of creating ‘sound effects’ for the onscreen action, and of drawing upon soundtrack tropes such as ‘western’ or ‘film noir’ when working from a film-based score. ‘We always try not to illustrate the movies, which don’t really need a soundtrack, but to really use them as a music score,’ he says. 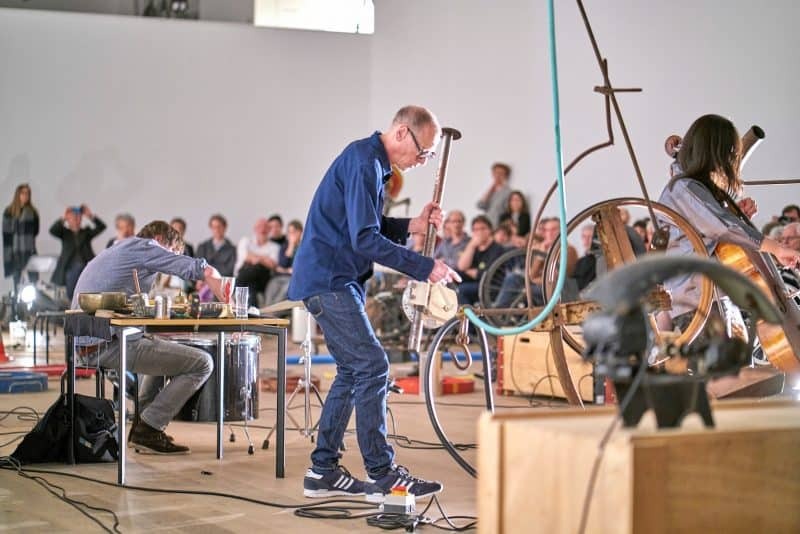 Van Houdt considers how he tackles a score such as Ephemera, Marclay’s collection of scraps of notation found ornamenting a jumble of items ranging from napkins and advertising to shower curtains, some of which may not even make much sense in conventional musical terms. ‘Mostly it is notational nonsense suggesting an image or atmosphere or style of music,’ he says. There are no rules when it comes to interpretation. ‘Whether using a system, code or free improvisations, these are all tools for making music out of Christian’s excellent score. Like The Clock, Investigations allows the fragmented instant captured in each photograph to be the foundation for new, time-based narratives constructed collaboratively by composer, musician and listener. Each musician’s act of archaeology is incomplete: it’s impossible to know exactly what was being played in each photo, or even if any notes ever resulted from the gestures. Instead, the void between image and sound is filled by each pianist’s own rich stock of past and future music.